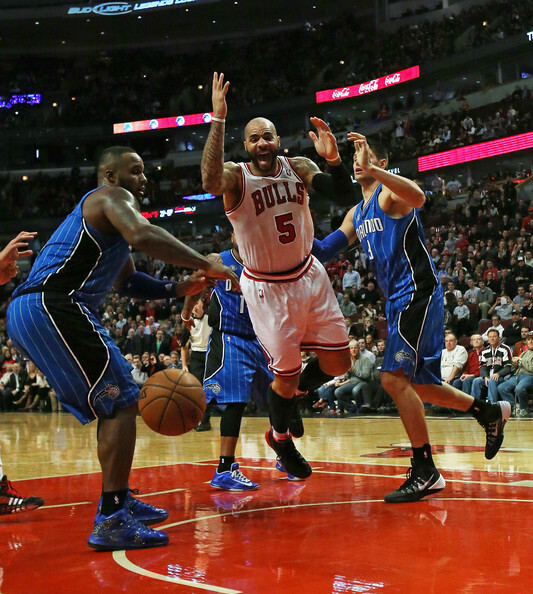 Carlos Boozer #5 of the Chicago Bulls looses control of the ball between Glen Davis #11 (L) and Nikola Vucevic #9 of the Orlando Magic at the United Center on December 16, 2013 in Chicago, Illinois. The Magic defeated the Bulls 83-82. NOTE TO USER: User expressly acknowledges and agrees that, by downloading and or using this photograph, User is consenting to the terms and conditions of the Getty Images License Agreement.